Jewellery can make any look more dynamic and vivid, speak volumes about your mood and creative character. Jewellery is a very personal thing, so there can’t be any strict rules about how to wear it, when and why. Just try different models, shapes and materials, and always choose with your heart. If you think that jewellery doesn’t fit your personal style, it’s quite possible you haven’t seen yet the ones that will take your breath away. But you know, everything happens for the first time, and I hope that in this guide, you’ll find your "love" and will live with it happily ever after. Laconic gold jewellery that will look equally elegant at the office, and at the party. Gold and silver jewellery with micro stones will give bohemian vibes to any look. Refined minimalism for daily life and nights out. The massive and delicate sculptural gold and silver jewellery perfectly mixes with organic semi-precious stones. Very interesting gold and silver jewellery that combines geometric shapes and soft lines. 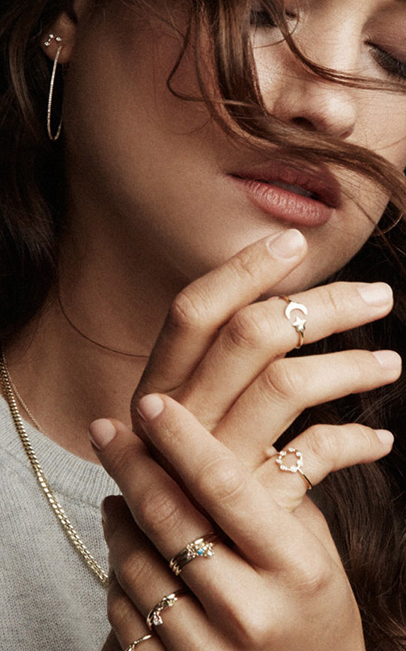 Affordable, simple, but very stylish jewellery for every day. Here you can find a lot of different styles and forms, but I especially like their micro size diamond stud earrings which fit perfectly with any wardrobe. Insanely beautiful massive jewellery in abstract forms. Affordable jewelry with unique precious and semiprecious stones that also promise on opening up all kinds of chakras. Hand-made jewellery that is able to tastefully accentuate the strength of your character. Big and stunning gold jewelry with clear geometric lines. Rare vintage and antique jewelry from different centuries, styles and shapes. Affordable jewelry made out of metal and silicone. Looks very interesting and unusual. These fun colorful jewellery adds charm and spontaneity to any look. Beautiful and stylish jewelry made out of natural wood, metal and stone. Where do you usually buy your jewelry? If you found this article useful, don’t forget to subscribe to the newsletter for even more goodies.